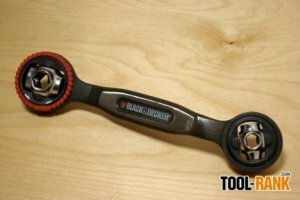 Up for review today is the Ratcheting ReadyWrench that was provided without cost by Black & Decker. The Ratcheting ReadyWrench is a dog-bone style wrench that features selectable sockets on both ends of the tool. Each end consists of four universal sockets that are capable of fitting both Metric and SAE nuts and bolts. This feature gives the wrench a total of 16 sockets in one tool. The main selling point of the Ratcheting ReadyWrench is the 16-in-1 design coupled with a new ratcheting system. Offering a total of 16 wrenches in one small package sounds very enticing, but all-in-one tools always have to compromise on something. In the case of the ReadyWrench, the compromise is the lack of a perfect fit on some bolt size. Because both Metric and SAE bolts share sockets on the Ratcheting ReadyWrench, some bolts will fit more snugly then others. I knew this would be one of the flaws with the ReadyWrench even before I set my hands one it, but was I was pleased to find that the supposed issue was hardly noticeable. This is by no means a tool to build airplanes with, but it should be fine to handle your DIY needs. To give you an idea; the size difference between Metric and SAE equivalents can be as little as .1mm, to a high of .5mm. If you have ever used a mechanical pencil, you can compare the size to .5mm lead. In many cases this difference in sizes could have been a problem, but because the RRW uses 6 sided sockets instead of 12 sided sockets, there is still plenty of surface area contact to allow for more then enough grip. However, using 6 sided sockets over 12 sided means the tool does not have the ability to work with square headed fasteners. This is a tradeoff between fastener compatibility and fit. The RRW fits the following bolt sizes: 5/16", 3/8", 7/16", 1/2", 9/16", 5/8", 11/16", 3/4", 8mm, 10mm, 11mm, 13mm, 14mm, 16mm, 17mm, 19mm. To change between socket sizes all you have to do is spin the 4-sided socket. Each socket head is labeled with both Metric and SAE sizes; so if you know what size you are looking for, it is easy to locate. It is also very simple to just spin through the sizes to find the the one that fits, even if you have no clue what size you need. The biggest asset of the Ratcheting ReadyWrench, is also responsible for one of its biggest drawbacks, and that is the addition of the ratchet. The ratcheting function itself is a huge plus for the tool, and we all know what a time saver ratcheting can be, but the added size the ratchet function brings to the tool is also a huge negative. The size of the ratchet means that the head of the tool will not fit into the places that most common ratchets can fit. At a minimum you will need 5/8" clearance if a bolt is against something like a wall, and 2"- 2-3/8" clearance if a bolt is in between two objects. The direction of ratcheting can be changed via a small orange ring that surrounds the body of the socket. A slight turn is all that is needed to reverse the direction, and a small indicator and arrows let you know which way the tool is set to free spin. The ring itself is made out of plastic and could possible be the weakest part of the tool. The rest of the wrench feel very solid. I did a few drop tests at 6 feet on to conerete and everything held up just fine. I thought I would put the RRW to the test on an old bike that offered a wide range of bolt sizes and had varying degrees of accessibility. Because the bike had been sitting outside for years, it also added a bit of rusted-on stuckness to the equation. Using the tool went as well as expected. As mentioned before, the tool does have clearance issues, but for the most part I could access everything in this particular test. When it came to trying to free the rusted bolts I came across a design flaw. Because the sockets can spin in the head of the tool, if you use a lot of force to free a bolt and don't push the tool exactly straight, the wrench can very easily spin off of the bolt. One way for Black & Decker to fix this in the next version would be to add some type lock and release. Pros: 16 sockets in one tool. Ratcheting function. Cons: Size of ratcheting head. Non-locking socket to prevent accidental spinning. Some plastic parts. The Ratcheting ReadyWrench cost just under $25 on Amazon, is actually cheaper then the older non-ratcheting version, and costs about the same as other brands similar non-ratcheting multi-wrenches. It seems to be priced within the market, but I feel that it is overpriced by about $5. Because the tool is made in China it could probably be priced at $20 and still make B&D some money.